SPINOZA: LIBERATOR OF GOD AND MAN is an Epic of Mind – the epic one of the greatest minds that ever lived. 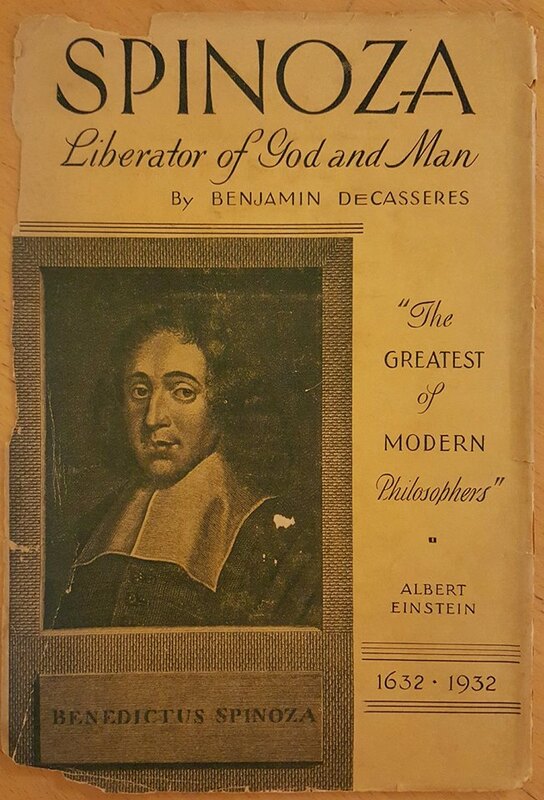 Written in the luminous, piercing style that has made Benjamin DeCasseres famous, you see in this book the mighty struggle of Spinoza with Intolerance , the serene pantheist at work polishing his lenses, and, above all, the interior of a mind, in eleven chapters, that is like an excursion of the Spirit of Man in high mental altitudes. 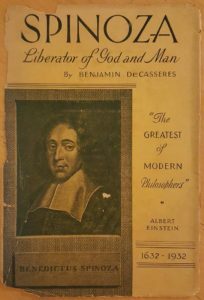 Benjamin DeCasseres brings to the light in this book hitherto unknown aspects of the doctrines of Spinoza: his liberation of God from the shackles of anthropomorphism, his glorification of the Will-to-Power, and his divinization of the Ego of the individual man. In the chapter entitled “Anathema!” DeCasseres has with a dramatic power only equaled in the pages of Victor Hugo or Merejkovsky pictured the excommunication from the Jewish Church of Benedict de Spinoza. Spinoza, at last, lives in this book. For it is the drama of a great soul written by a man who has the blood of Spinoza in his veins. All matter in italics and quotation marks not otherwise credited is from the works of Spinoza. THIS book is an exposition of the mind and doctrines of Spinoza in my own terms. I have placed his doctrines under a light which no one has dared to do before. I projected the book as not only an exposition of certain sides of his philosophy and life (and the two are inextricably mixed) but as a tribute on the three-hundredth anniversary of the birth of one of the few great thinkers of all time. There is very little to relate tin the physical life of a man whose career is dedicated to pure thought. But for those who are not familiar with Spinoza`s life I will here give in this Foreword all the facts that are known. These facts are taken from the only two biographies of Spinoza. One is “The Life of Benedict de Spinoza,” by John Colerus, minister of the Lutheran Church in The Hague, published in 1705, and the other is the one attributed to Jean Maximilian Lucas, published in 1719. Benedict de Spinoza was born at Amsterdam on November 24, 1632. His father, a Portuguese Jew, was a merchant. The Spinozas were originally refugees into Holland from the Spanish Inquisition. It is said that Spinoza`s mother had Moorish blood in her. Spinoza was christened Baruch (the Blessed), but when he was excommunicated from the Jewish congregation at Amsterdam for heresy he changed his name to the Latin equivalent, Benedictus. He was henceforth known, and will always be known as Benedict. Spinoza as a youth had a quick mind and a penetrating wit. He desired to learn Latin and was sent to study that language under the famous Franz Van den Ende. The latter was said to have been an atheist. Van den Ende had a brilliant and beautiful daughter, who taught his scholars Latin as well as music in the many mysterious absences of her father.. Spinoza fell in love with the girl, as also did one Kerkering, a native of Hamburg. The latter presented to his sweetheart a necklace of pearls, something that was far beyond Spinoza`s means. The fair one because of this and other presents married Kerkering. And thus it was that Spinoza remained a bachelor for the rest of his life. Van den Ende himself was subsequently hanged in Paris for fomenting an insurrection. Spinoza also took up the study of theology, mathematics and natural philosophy. He became a student of René Descartes, who exercised a great influence on his mind. He turned the youthful Spinoza from Revelation to Reason. He became only a perfunctory attendant at synagogue. The rabbis feared he would become a Christian, but although he often frequented the society of Mennonites and other Christian sects he never joined any of them nor was he ever baptized. Francis Halma in his “Account of Spinoza” (quoted by Colerus) says that the Jews offered him a pension of a thousand florins some time before his desertion to appear in their synagogue, but this he refused, saying he was not a hypocrite and “desired nothing but the Truth.” Finding that he could not be bribed, he was set upon by a man who attempted to stab him as he was coming from a playhouse. The knife went through his cloak, which he kept all his life as a “memorial of that event.” The dates of the attempted bribing and assassination are not given. Because of a mix-up in dates there is some questions as to the romance between Spinoza and the Van den Ende enchantress; but I prefer to believe it. Dates are often typographical errors, but facts and often-repeated myths are not. Benedict de Spinoza was finally excommunicated from Jewry in 1656, in his twenty-forth year. Amsterdam now was no longer a safe place for the outlawed Jew who thought Descartes a greater man than Moses. He was warned that he better move on. He went to live on the Old Church Road, not far from Amsterdam, with a sect called Collegiants. They were a Quaker-like sect and Commanded Spinoza’s respect. They were allied with the Mennonites. He learned the trade of grinding lenses. He was also fond of drawing and watching spiders fight. When not grinding lenses for his daily bread, Spinoza was studying. A philosophical circle formed around him. Young Simon de Vries, one of his enthusiastic admirers, offered Spinoza a gift of 2,000 florins, but Spinoza refused it. In 1661 (or 1664) Spinoza removed to Rhijnsburg, near Leyden, the headquarters of the Collegiant brotherhood. The house in which he lived is still standing, the road on which it is situated being called Spinoza Lane. His fame continued to spread among the intellectuals of Europe. A little later Spinoza went to Voorburg, a little village about two miles from The Hague. It was here that he probably completed his “Ethics.” He was, however, afraid to publish it because of his enemies in Amsterdam and especially because of the bitter enmity toward him of his early teacher, the Rabbi Saul Levi Morteira. In 1670 he had printed anonymously, disguising the name of the printers and the publisher, his famous “Tractatus Theologico-Politicus,” the first critical book on Biblical inspiration. In this year he moved into The Hague. The house in which he moved became the residence afterward of Colerus, the Lutheran minister who wrote his biography. Here he lived a frugal life, receiving his friends and spending his leisure in conversation with the humble church-going people with whom he lived and who adored this simple, kindly lense-grinder. I mentioned further in this book the only time that Spinoza lost his philosophic calm. It was in 1672 when Louis XIV invaded the Netherlands. Spinoza`s friends, Cornelius and John De Witt, were murdered by a mob for trying to preserve the republican constitution against a military dictatorship. Spinoza nearly lost his life in defence of his friends. In 1673 Spinoza received an invitation to become a professor in the University of Heidelberg. This was extended by the Elector palatine. But there were so many strings about what he should teach that he declined. Nothing could budge him out of his fierce independence. At the invitation of the prince de Condè, who was curious about the growing fame of Spinoza, he was invited to come into the French lines for an audience. Spinoza went under a self-conduct. He did not meet the Prince. There were murmurs of “treason.” But Spinoza, always serene and unperturbed (except in the case of his friends the De Witts), paid no attention to the rumors. Spinoza had been tuberculous for some years. He died with only his physician present on Sunday afternoon, the 21st of February, 1677, in his forty-fifth year. Many illustrious persons and six coaches followed him to the grave. The Samuel de Casseres mentioned in this book married the youngest sister of Spinoza, Miriam. Of that marriage I am a direct descendant. The blood of Spinoza is in me, as I am his nephew by nine removes. Let there be Light!, said God. There is too much light!, declared Buddha and Schopenhauer. I am quite satisfied with what light He gave me, said Shakespeare. I´ll add a sun, quietly remarked Spinoza.